So how did the Pacific halibut fishery end up the way it did in 2015? It was the culmination of work that occurred over several years by state, federal, international, and constituent input. Prior to 2008, the Pacific halibut fishery in California was fairly limited, and catches did not exceed the quota that was shared between California and part of Southern Oregon. Beginning in 2008 catches for Pacific halibut began increasing and peaked in 2013 at 43,254 net pounds [net pounds are fish that have been headed and gutted; the International Pacific Halibut Commission (IPHC) uses net pounds to manage the entire fishery]. 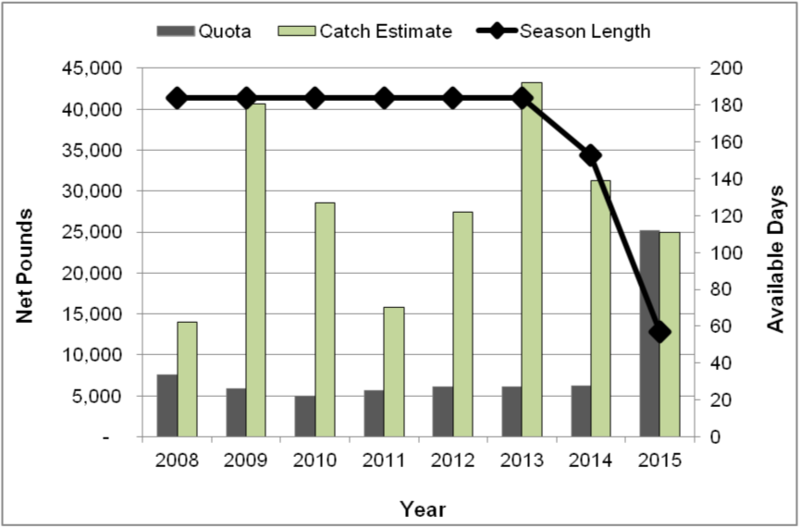 During the time between 2008 and 2014 annual catches exceeded the federally set quota (about 6,000 net pounds), but there was no expectation for catches to remain under the quota, and no mechanism to hold catches to the quota. As a result of these increased catches and consistent quota exceedance, there was pressure for California to take action to prevent future catches from exceeding the quota. The first step in this process was to provide California with its own allocation and quota separate from Southern Oregon. In November 2014, the Pacific Fishery Management Council approved changes to the recreational Pacific halibut fishery in California for 2015 that included an increased allocation percentage which would provide a higher quota. The agreement which resulted in an increased allocation percentage to California required decreases to the allocations for the recreational fisheries in Oregon and Washington and the commercial fishery. An integral part of reaching this agreement was the expectation that the California Department of Fish and Wildlife (CDFW) would manage the recreational fishery to ensure the quota would not be exceeded. This included changes to season dates, new inseason weekly catch tracking, and a provision for an early season closure by the National Marine Fisheries Service (NMFS) if catches were projected to reach or exceed the quota before October 31. The California Recreational Fisheries Survey (CRFS) supplies monthly catch estimates for all marine finfish including Pacific halibut. Producing CRFS estimates requires information on catches and effort from several sources. 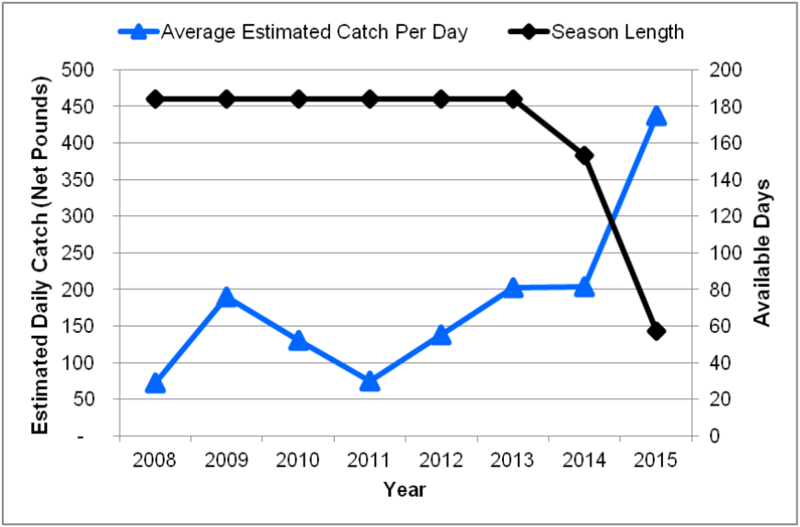 As a result, there is a five- to eight-week lag time between when the catch data are collected and when catch estimates using angler effort are generated. In order to conduct weekly tracking of Pacific halibut, CDFW developed customized tracking by using preliminary sample information directly from CRFS weekly field reports. These preliminary CRFS reports were used to generate a Preliminary Projected Catch amount of Pacific halibut in net pounds. The weekly Preliminary Projected Catch is a “proxy” value used to approximate catch during the lag time, until the corresponding monthly CRFS estimates become available. Once CRFS estimates for a month become available this value replaces the weekly projected catch amount for that month. How’d We Do in 2015? From a fishery management perspective, the inseason tracking and closure mechanism worked efficiently. Taking into consideration the varied needs of diverse constituents, season dates were chosen based on the need to keep catches from exceeding the quota. CDFW conducted outreach in person, online, and via a call hotline to educate the public about the new and very different season dates and inseason monitoring process. The new inseason monitoring process functioned as planned, with weekly preliminary catch projections being used to gauge catches prior to the CRFS estimates being produced. When the catch projections showed that the quota was close to being reached during the August fishing period, NMFS in consultation with CDFW and the IPHC determined an early fishery closure was necessary to prevent exceeding the quota. 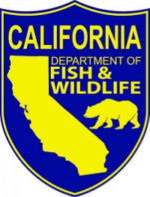 Additional outreach was conducted by CDFW to inform anglers about the early season closure, and no fishery violations were reported by law enforcement after the closure. Final season catch estimates became available in mid-November and show that 24,906 net pounds (Table 1), 99 percent of the 25,220 net pound quota, were taken during 2015. Table 1. Preliminary 2015 Pacific halibut catch estimates in California by month. CDFW projection values for May through August are provided in strikeout to illustrate the process of replacing the projections with CRFS estimates when those estimates became available five to eight weeks later. How’d You Do in 2015? Again, that depends on who you ask. Due to the more limited open fishing dates and prevailing weather conditions some anglers may not have fished as often as they expected. The early season closure also impacted those who had planned to fish during the last few days of the August fishing period, or any of September or October. Poor weather also seemed to prevent anglers form fishing during the May and June open periods. For a week and a half in July, and August the weather was great and many anglers who were able to fish during those time periods were very successful in catching Pacific halibut. How Did The 2015 Fishery Look Compared to Previous Years? Unsurprisingly, changes to California’s recreational Pacific halibut season length have coincided with changes in average estimated daily catches. The 57 open fishing days during 2015 was almost a 70 percent decrease compared to the annual number of open fishing days from 2008-2013 (Figure 1 and Figure 2). From 2008 to 2013, an average of 60 to 200 pounds of Pacific halibut was caught per day (Figure 2). In 2014, the season length was reduced by one month (August closed) from 184 days to 153 days, and average daily catch was just over 200 pounds per day. In 2015, when the season length was further reduced to only 57 days, average daily catch rose steeply to over 400 pounds per day (Figure 2). The abrupt increase in the average daily estimated catch from 2014 to 2015 may be an indication that the recreational Pacific halibut fishery in California is transitioning to a derby style fishery, much like many areas of Oregon and Washington’s recreational Pacific halibut fisheries. In addition, it indicates that even with increased effort on open days, there are a lot of successful Pacific halibut anglers out on the water. Figure 1. California allocation, catch estimates, and number of days open to fishing by year from 2008-2015. Quota prior to 2014 was shared with Southern Oregon. Prior to 2015, there was no mechanism for inseason action if the quota would be exceeded. Catch data for 2015 are preliminary. Figure 2. Average estimated volume (net pounds) of Pacific halibut caught per day and number of open days per year from 2008-2015. Data are from CDFW and CRFS. Catch data for 2015 are preliminary. Despite the recent changes in catch and fishing effort, the proportion of fishing activity by general locations of catch in California has remained fairly steady. 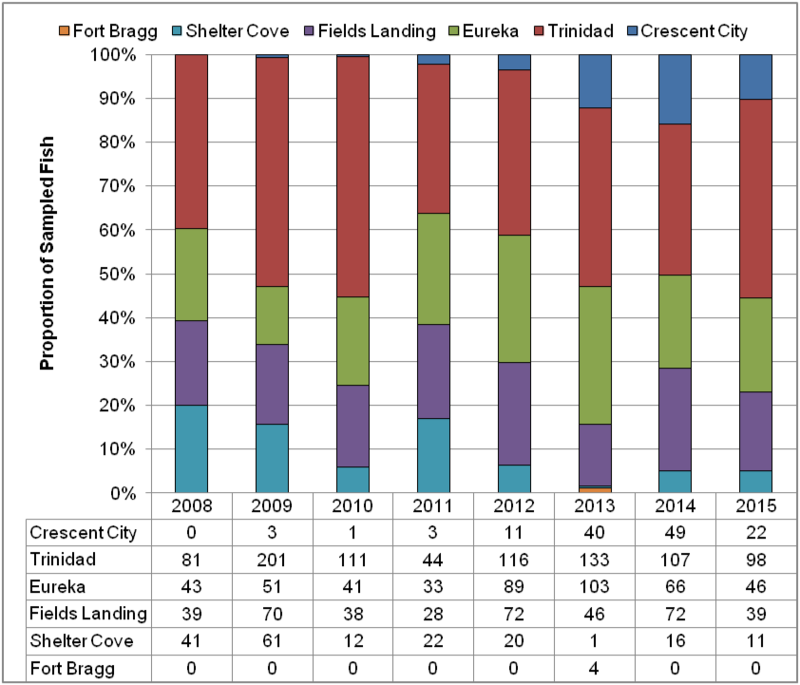 From 2008 to 2015, 85 percent of the sampler-examined Pacific halibut have come from three port areas: Trinidad, Eureka, and Fields Landing (Figure 3). The amount of sampling coverage in each area during each year has remained the same. Figure 3. Annual proportion of sampler examined Pacific halibut (chart) and number of individual sampler examined Pacific halibut (table) by port area in California. Data from CRFS. CRFS data also provides information on sizes of fish encountered by samplers. CRFS samplers measure the length of fish they examine, and weigh the fish (time permitting). From 2013 to 2015, sampler examined Pacific halibut ranged from 20 to 58 inches long; approximately half of the measured Pacific halibut have been between 30 and 40 inches long (Figure 4). During this same time period, sampler examined Pacific halibut weights have ranged from less than five net pounds up to 78 net pounds (Figure 5); approximately half of the fish weighed each year are between 10 and 25 pounds net weight. Figure 4. 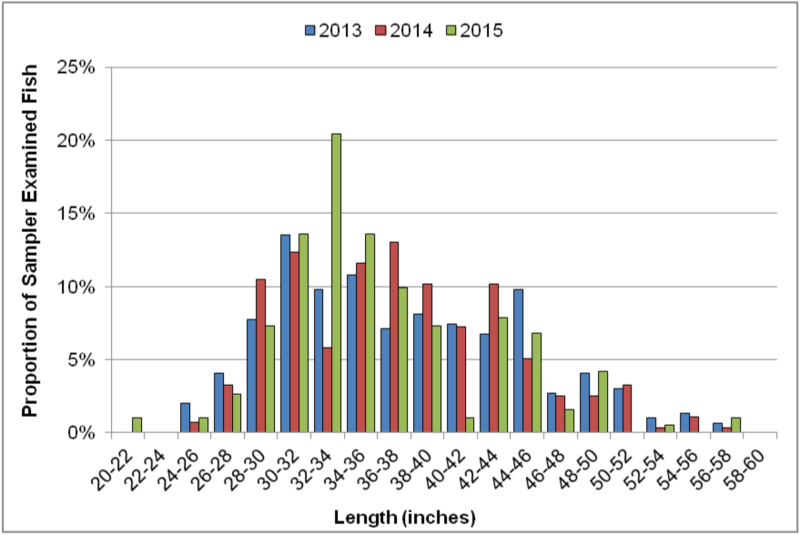 Lengths (inches) of sampler examined Pacific halibut by year from 2013-2015. Data are from CRFS. Figure 5. 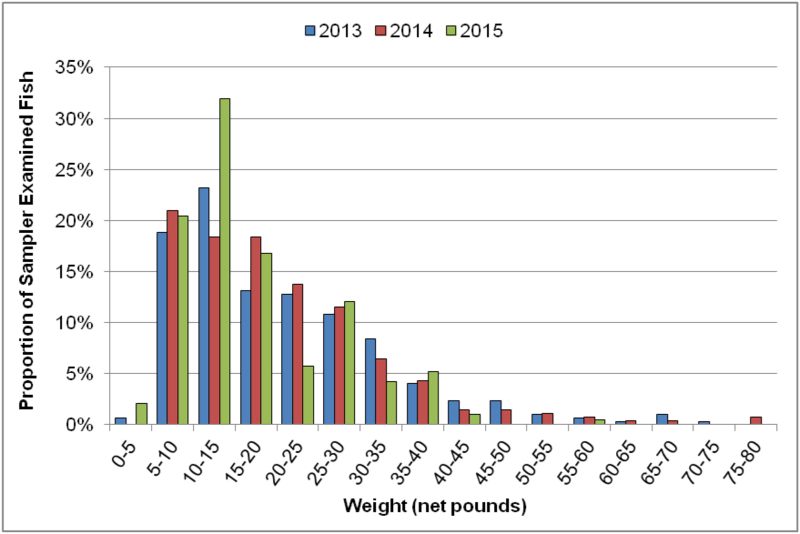 Weights (net pounds) of sampler examined Pacific halibut from 2013-2015. Data are from CRFS. On January 29, 2016, the IPHC set the Area 2A (Washington, Oregon, and California) catch limit at 1,140,000 net pounds, which resulted in a 2016 California recreational Pacific halibut quota of 29,640 net pounds – an increase of about 4,000 pounds compared to the quota in 2015. However, based on previous years’ fishing effort, CDFW predicts that the 2016 quota did not increase enough to allow for any meaningful increase to the season length. Therefore, the season dates in 2016 will be the same as in 2015, with the same inseason tracking and monitoring and provisions for early season closure if the quota is projected to be attained. While continued limitations to season lengths and fishing opportunities are not pleasant, CDFW knows that holding catches to the quota will continue to demonstrate a commitment to responsible management of the fishery now and in the future. This commitment should result in greater opportunities at the Pacific Fishery Management Council to bargain for continued increases to our allocation and work towards receiving a more fair and equitable allocation. For more information about the Pacific halibut fishery in California, and weekly catch updates during the season, please visit CDFW’s Pacific halibut webpage at: https://www.wildlife.ca.gov/Conservation/Marine/Pacific-Halibut.